Christopher – is that a photograph of a set of miniatures? It almost looks like a still from Mr. Rodgers neighborhood. How did you get that effect? Long answer: The look of the photo is in a style that’s popular now simulating so-called “tilt-shift photography.” Tilt-shift lenses pivot and rotate in relation to the film plane to achieve optical effects like making the lines of a tall building parallel when shooting from a low angle, or artificially reducing the depth of field. 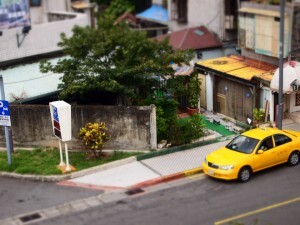 Since macro photography has an extremely shallow depth of field, using a tilt-shift lens on a large scene makes it appear to be a miniature. The depth-of-field effect can also be achieved with Photoshop or other digital post processes. The short answer, though, is that this photo was taken from the above ground subway looking down at the street with a camera that has a tilt shift preset that blurs the edges of the frame and saturates the colors automatically. It’s a shortcut I know, but I love the effect too.